Kawatake Shinshichi II's drama "Miyakodori Nagare no Shiranami" was premiered in the 3rd lunar month of 1854 at the Kawarasakiza [casting]. It was a kakikae kyôgen based on the real-life so-called Yoshida incident, which happened during the Heian period: a Kyôto boy named Yoshida Umewakamaru was kidnapped by a human trafficker called Shinobu no Sôta. On the way to Ôshû, Umewaka became very ill and is said to have passed away in Edo on the banks of the Sumida River. Police forces are looking for fugitives of the Kyôto Yoshida family. This family was victim of internal rivalries resulting in the murder of the master and the loss of Miyakodori , a priceless seal. After the downfall of the Yoshidas, Yoshida Matsuwakamaru, the young heir, has fled and nobody knows where he is. The younger son Umewakamaru is said to be on the road to Edo with his mother Hannyo Gozen. Umewakamaru and his mother arrive before the Inari Shrine at Mimeguri. They are accompanied by the yakko Gunsuke, their faithful servant. Their plan is to take shelter with Gunsuke's married daughter Okaji who is said to be living somewhere near the Sumida River. Then, they will try to find both the missing Matsuwakamaru and the lost seal. They are suddenly attacked by the police forces. The yakko Gunsuke fights the assaulters but is separated from Hannyo Gozen and Umewakamaru. The mother quickly hands over 200 ryô and a scroll holding the family lineage to her son and tells him to take refuge elsewhere, while she will remain behind and protect him from their enemies. Umewakamaru is hurrying away through the dusk when he is accosted by some villains. They try to steal the money but a palanquin suddenly comes by and the palanquin bearers chase the thieves away. The relieved Umewakamaru is victim of a severe stomachache. The occupant of the palanquin, a man named Shinobu no Sôta, comes out to help the young boy. He is in reality Yamada Rokurô, a former retainer of the Yoshida clan. Here is the story of Shinobu no Sôta: while at the service of the Yoshidas, he fell in love with a lady-in-waiting named Kajino, who was none other than the daughter of Gunsuke. This was a serious offence punishable by death. Hannyo Gozen took pity on them and, with her help, the lovers were fortunately spared and able to fly to Edo, settling in Mukôjima, Sôta became a gardener and Kajino called herself Okaji, becoming a sakuramochi seller. Sôta, who had heard of the downfall of the Yoshida clan, had been hoping for a chance to help locating the missing son Matsuwakamaru. He also became acquainted by chance with a Yoshiwara courtesan named Hanako, who has a close physical resemblance to Matsuwakamaru. He became a regular patron for Hanako and has visited her almost every day since their first meeting. Learning that she was seeking to purchase the Miyakodori seal now in the possession of an antique dealer, Sôta plans to buy it for her … and also to ransom her. So far it was a dream as Sôta has no money and … had also become mysteriously afflicted with blindness. While helping Umewakamaru, Sôta finds the bundle of 200 ryô in his possession. He asks the boy to lend it to him, but Umewakamaru refuses. Sôta, who doesn't know the real identity of the boy, is ready to do anything to get the money. He accidentally throttles Umewakamaru without realizing what he is doing until it is too late. Sôta offers a quick prayer for repentance and leaves the body with the money. He bumps into the anma Ushiichi, a greedy and evil person, and Sôta drops the packet of money. A third character appears on stage, the otokodate Katsushika Jûemon. He is followed on the opposite side of the stage by the courtesan Hanako. She has run away from the pleasure quarter and looks in distress. The four characters are now together in the dark, unable to see each other. This is the beginning of a sewamono danmari, with Jûemon's foot touching the money. The three men quickly try to pick it up at the same time. Hanako moves in on the trio and the money is dropped as the three back off. Two sets of 100 ryô fall out of the bundle. Jûemon and Sôta each end up with a packet of 100 ryô, while the anma seizes the precious Yoshida scroll. In the meantime, Hanako runs away. Okaji is busy selling sakuramochi. She hears that the Yoshiwara courtesan Hanako is under surveillance because of her close physical resemblance to the bandit Tengû Kozô Kiritarô (who is in reality none other than Yoshida Matsuwakamaru!). She now understands why her husband has become the patron of Hanako. The yakko Gunsuke appears on stage. He is looking for the home of his daughter Okaji which should be somewhere in the neighborhood. He meets the antique dealer Kohei who had sold the Miyakodori seal to Sôta and has now come to collect the due money. They go together to the sakuramochi shop. Okaji welcome them, telling Kohei that Sôta is away trying to obtain the money. She recognizes her father and is happy at this unexpected reunion but quickly cuts him short before he can explain his presence here, then she sends the two visitors inside to await Sôta's return. Okaji wants to make a good meal to welcome her father. As there is no money, she dispatches somebody to the pawnshop to pawn some goods and to purchase food. Meanwhile, the courtesan Hanako suddenly enters the house, startling Okaji. Sôta makes his appearance and Hanako clings to him, asking him to confirm her identity and say that she is not the thief Kiritarô. Okaji, who is both upset and surprised by the appearance of Hanako and her resemblance to Matsuwakawaru, tells Hanako that she is just a maid helping Sôta during the absence of his wife. Hanako explains to Sôta that she has fled from Yoshiwara because the otokodate Katsushika Jûemon is ready to ransom her from her brothel. Her proprietor has accepted to get rid of her. She is here to meet Sôta for the last time and commit a shinjû with him. The blind Sôta and Hanako amorously go together to another room. The yakko Gunsuke, who has witnessed everything, comes out in anger and is about to leave his daughter's house. Okaji tries to stop him but Gunsuke tells her that he can't trust the depraved Sôta. He takes a packet of medicine out of her sleeve. This is a treasure of the Yoshida clan, a strong medicine which can cure blindness if mixed with the blood of a woman. He was willing to give it to Sôta but not now. Then he takes his leave in spite of Okaji's remonstrance but he is careful to surreptitiously drop the medicine. At the same time, the ornamental pin in Okaji's hair, a legacy from her late mother, falls to the floor. She finds by chance the medicine and realizes that, by killing herself and mixing her blood and the medicine, she could help curing Sôta's blindness. She needs to know more about Sôta and Hanako relationship before taking her decision. Two new visitors come to the house. One is here to take Hanako back. The other is working for the Nagaokaya house, a kimono-lending business, to whom Sôta is in debt. Sôta makes his appearance and tells the two men he has no intention of handing her over. The otokodate Katsushika Jûemon suddenly enters the house and says he has come to claim the courtesan whom he has already ransomed. The two proud men, the blind man and the otokodate confront each other. They are about to fight when Hanako appears between the two and says that she is in love with Sôta, not Jûemon. At this point Kohei comes in and asks Sôta for the due 100 ryô. As the penniless Sôta can't take any action, Kohei angrily puts his greedy hands on the precious seal. Hanako realizes that this is indeed the longed Miyakodori. Sôta, anxious not to lose it again, gives Umewakamaru's 100 ryô to Kohei, the money needed to ransom Hanako. Then he gives the seal to Hanako as a testimony of his love for her, losing at the same time the means to purchase back her contract at her house of assignment. In the meantime the kimono-lender, who has watched everything, comes in and says he will take back not only the kimono loaned to Sôta but also Hanako's kimono as well. He strips them of their outer kimono and leaves the pair in their underclothes. Silent witness of this entire scene, Jûemon starts to realize that Okaji might be a sister whose whereabouts he does not know now. Finding by chance her hair ornament, he recognizes it as the proof that Okaji is indeed his long lost sister. Without revealing anything, he changes his plan. Hanako, who knows that Sôta can't redeem her (miuke) anymore, asks Jûemon to purchase her for 100 ryô. Jûemon agrees to the deal: Hanako will stay with Sôta until the lovers can repurchase her but she will not sleep with Sôta. Jûemon hands over Umewakamaru's 100 ryô to pay for Hanako's freedom. Jûemon leaves the stage. Left alone with Sôta, Hanako does a quick check to confirm his blindness, then she puts her fingers in his ears and calls a few men who have been waiting outside. The blind and deaf Sôta can't hear what she says to them. Hanako, who reveals her true identity as the thief Tengû Kozô Kiritarô, orders them to steal all the valuables in this house. Now it is the turn of the evil masseur Ushiichi to come by with a man named Iwazô. They are both henchmen of Kiritarô. Ushiichi, who knows that the authorities suspect that Hanako is in reality Kiritarô, has secretly decided to betray Kiritarô. He has disguised himself as a blind masseur for he does not want to be recognize. If he succeeds in locating Kiritarô and informing the authorities, he will get a big reward. Sôta hears the blind masseur's whistle, who is summoned inside to give Sôta a massage. It does not take too long for Hanako and Ushiichi to recognize each other. Ushiichi takes out the scroll and shows it to Hanako. Then, he claims to be Hanako's real husband and he wants her back at his home. Sôta feels that he has been fooled around by the courtesan but in his blindness he can do nothing. Hanako tells him she returns to him the token of his love, the Miyakodori seal. She gives Sôta the container, which contains a worthless object instead of the seal. The blind Sôta is not aware of the substitution. Ushiichi and Hanako leave the house. The yakko Gunsuke comes running back to Sôta's home. He went at the site where he had left Hannyo-no-Mae and her son Umewakamaru, finding that Hannyo-no-Mae had been captured by the enemy and Umewakamaru had been murdered. He has brought with him a piece of evidence which should help identifying the boy's strangler. Sôta is shocked to realize that the boy whom he killed was the son of his former master. He confesses his crime to Gunsuke, telling everything about his plans and finally giving him the seal container. Gunsuke immediately discovers the substitution. The yakko Gunsuke, who has failed, tries to kill himself but Sôta tries to prevent him from killing himself. Because of his blindness, he unfortunately accidentally wounds Gunsuke. Sôta now tries to kill himself but his wife succeeds in stopping him. Then she stabs herself to get the necessary blood to mix with the medicine left by her father. She gives the miraculous mixture to Sôta, whose eyesight is instantaneously restored! Jûemon, who has witnessed everything, enters to the room. He gives words of encouragement to Sôta and reveals his real identity to the dying Okaji. Sôta hurries off to Ushiichi's house in order to get back the Miyakodori seal. The anma Ushiichi, congratulated by his Neighbors for his new bride, has ordered his previous mistress Oichi to prepare a celebrating feast. Oichi complains about the situation and Ushiichi pretends to chase her out of his home, whispering to her as she leaves that Hanako is indeed Kiritarô. He asks Oichi to go inform the authorities. Hanako pretends not to notice but he (not she!) is quite suspicious of the anma. They start to casually drink and chat. Hanako asks innocently about the scroll that Ushiichi had shown him at Sôta's house. Could it be valuable and sold for a good amount of money? Hanako gets the confirmation that Ushiichi has the scroll in his possession. She makes him drink a lot of sake until he falls into a drunken sleep. Looking for a weapon, Hanako picks up a sharpened knife and stabs the masseur. There is a short struggle but Ushiichi is helpless and quickly dies. Yoshida Matsuwakamaru, alias the bandit Kiritarô, alias the courtesan Hanako, is now able to take possession of the precious family scroll. This is also the end of his career as a bandit, whose main goal was the retrieval of both the seal the scroll. Sôta appears on stage and can hear this soliloquy. He immediately realizes that Hanako is indeed Yoshida Matsuwakamaru! 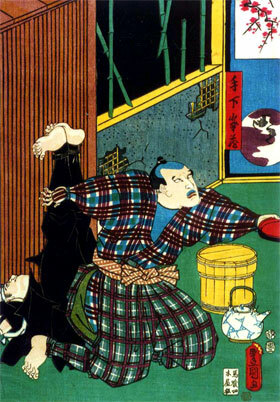 Sôta attacks Matsuwakamaru with his sword and Matsuwakamaru wounds him in self-protection. Matsuwakamaru is about to kill the wounded Sôta, who holds Matsuwakamaru back and begins his confession. He reveals his true identity and confesses the accidental murder of Umewakamaru. On hearing his confession, Matsuwakamaru realizes that without the help of Sôta, he would have never been able to retrieve both the Miyakodori seal and the precious Yoshida scroll. Unfortunately for them, time is running out. One of Matsuwakamaru's faithful henchmen comes to warn them. The area is surrounded by police officers who came to capture Kiritarô. Matsuwakamaru stays calms and orders nonchalantly Sôta's henchman to put some rice in a bowl and boil some tea before he goes. The police officers start banging away at the door. Minezô, one of Kiritarô's henchmen, now a bounded prisoner, is forced to call inside. The officers hope that Kiritarô will stupidly open the door. Matsuwakamaru indeed opens it but he is quick enough but let Minezô in before slamming the door on the officers' faces. Matsuwakamaru calmly orders Minezô to bring and serve rice and tea to him. In the meantime the pursuers break into Ushiichi's home and attack Matsuwakamaru, who fights them off handily. 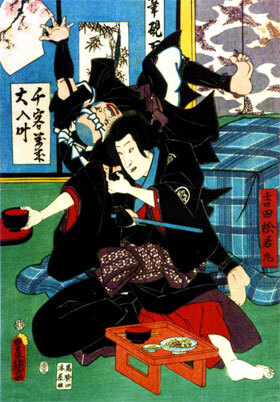 Minezô brings the food and Matsuwakamaru nonchalantly partakes of the meal while continuing to fight off the police officers, who fall on the floor unconscious one after the other. Minezô's role is to pull the bodies to the doorway. Then, when some of them regain consciousness, they try to attack again but this offensive does not prevent Matsuwakamaru from calmly ordering Minezô to fill his cup with tea. Minezô triumphantly serves his master as the curtain is drawn!